Do you remember, when you were a child, getting a card and shaking it to see if any money falls out? I do and if you're feeling generous and want to send some cash for your favorite kiddies, these free printable cards card are the ones to do it in! 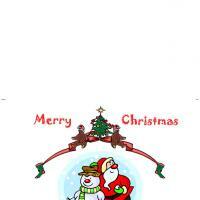 this printable Christmas card not only has a handy slot for holding money safely tucked away. 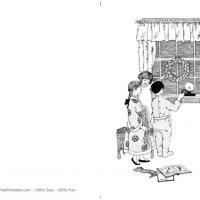 The well done cartoon imagery also features the importance of the less material things like the importance of a happy Christmas and enjoying the simple acts. With this surprise, kids who receive it will surely have the Christmas that just what is written on the card: happiness and goodwill! There are difficult people on every list . Green is the color that fits everyone. Never miss a chance to tell the people we love that we are thinking of them during the holidays. 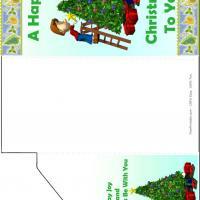 Using our free printable cards such as the Xmas Tree Money Card is a great way to warm up the holiday season. Whether you decide to send one card or a hundred, you can choose from our collection featuring Xmas Tree Money Card, ribbons, Christmas trees, ornaments, and other festive eye catchers. Try our free printable cards today, and you won't be sorry when it comes time to celebrate with a surprise in all of your holiday cards. 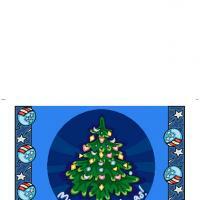 When you are thinking about the holidays, you start planning and Xmas Tree Money Card can help you plan your budget. This year consider using the free printable cards from our site to save a little extra to go inside the cards. This Xmas Tree Money Card is a great place to start. These holiday cards are fantastic projects for your kids. Instead of using a box of standard cards that are all the same, you can scroll through our collection and find just the right card for each person on your list. Remember green is the size that fits everyone. 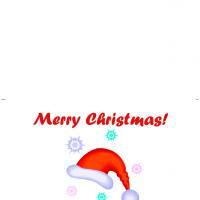 Use our Xmas Tree Money Card to make your custom impression today!